Cartoonist George Tuska, probably best known for his run on Marvel's Iron Man in the '60s, passed away recently. This prompted me to go to my files and pull out these pencil drawings he sent me in October of 2000. I'd written him a fan letter, and asked if he had any drawing advice he'd pass on to aspiring cartoonists. I wasn't teaching at MCAD yet, but had taught a few cartooning classes at schools and museums in the Quad Cities area, so thought it a question worth asking. 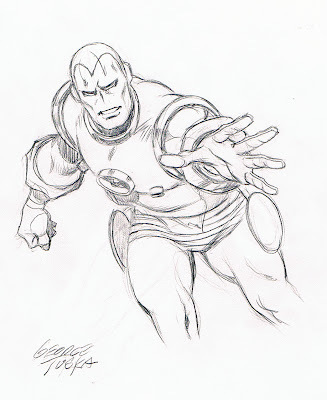 George responded with this lovely pencil drawing of Iron Man -- and a page of notes on inking. 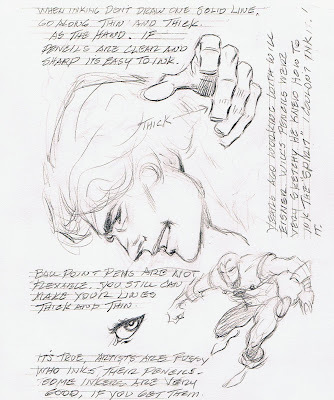 The sideways comment reads: " Years ago working with Will Eisner, Will's pencils were very sketchy. He knew how to ink The Spirit. I couldn't ink it!" Wow that is great! He was a fantastic artist. I know Twomorrows has a book about him that I need to get.